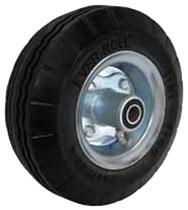 Never Flat Pneumatic Wheels (Centered Hub) are made from a micro-cellular polyurethane foam and offer the same advantages of as a pneumatic tire without the possibility of leaking air out. These wheels provides shock load protection and a smooth cushioned ride, rolling easily over debris and small obstacles. Wide, soft tread face is ideal for rolling on grass, sand, dirt, etc. Non Marking. Available with precision bearings that offer maximum roll-ability and are maintenance free upon request. Saw-tooth tread design offers both traction and maneuverability. Perfect for hand trucks, dollies, carts & mobile equipment such as generators, lawn & garden equipment, etc. *Default is 1/2" I.D. Ball Bearing (Fits 1/2" Diameter Axle) Other bearing sizes available.